Wife and aunt of Amram, and mother of Aaron, Moses, and Miriam (Ex. vi. 20). She was the daughter of Levi, and was born in Egypt (Num. xxvi. 59). In the account of Moses' birth, Jochebed is indicated merely as being the daughter of Levi, her name not being given (Ex. ii. 1). Jochebed is identified by the Talmudists with Shiphrah, one of the midwives ordered by Pharaoh to kill the new-born male children (Ex. i. 15 et seq. ); the name is given various interpretations (Soṭah 11b; Ex. R. i. 17). The "houses" with which God recompensed the midwives (Ex. i. 21) were those of priesthood and royalty, realized, in the case of Jochebed, in the persons of her two sons Aaron and Moses (Ex. R. xlviii. 5). She is further identified with Jehudijah (I Chron. iv. 18), this name, interpreted as "the Jewess," being given to her because, by disobeying Pharaoh's order, she founded the Jewish nation (Lev. R. i. 3). To elucidate Gen. xlvi. 15, where the children of Leah are said to be thirty-three, while only thirty-two are enumerated, the Midrash names Jochebed as the thirty-third. But as this would appear to conflict with Num. xxvi. 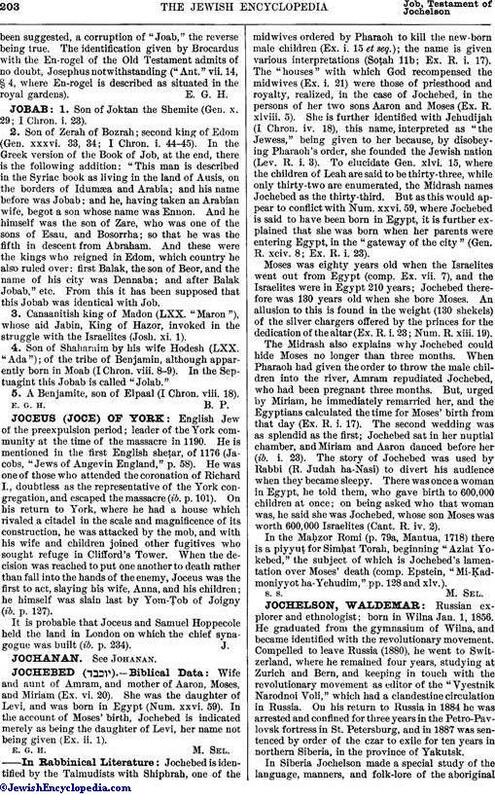 59, where Jochebed is said to have been born in Egypt, it is further explained that she was born when her parents were entering Egypt, in the "gateway of the city" (Gen. R. xciv. 8; Ex. R. i. 23). Moses was eighty years old when the Israelites went out from Egypt (comp. Ex. vii. 7), and the Israelites were in Egypt 210 years; Jochebed therefore was 130 years old when she bore Moses. An allusion to this is found in the weight (130 shekels) of the silver chargers offered by the princes for the dedication of the altar (Ex. R. i. 23; Num. R. xiii. 19). The Midrash also explains why Jochebed could hide Moses no longer than three months. When Pharaoh had given the order to throw the male children into the river, Amram repudiated Jochebed, who had been pregnant three months. But, urged by Miriam, he immediately remarried her, and the Egyptians calculated the time for Moses' birth from that day (Ex. R. i. 17). The second wedding was as splendid as the first; Jochebed sat in her nuptial chamber, and Miriam and Aaron danced before her (ib. i. 23). The story of Jochebed was used by Rabbi (R. Judah ha-Nasi) to divert his audience when they became sleepy. There was once a woman in Egypt, he told them, who gave birth to 600,000 children at once; on being asked who that woman was, he said she was Jochebed, whose son Moses was worth 600,000 Israelites (Cant. R. iv. 2). In the Maḥzor Romi (p. 79a, Mantua, 1718) there is a piyyuṭ for Simḥat Torah, beginning "Azlat Yokebed," the subject of which is Jochebed's lamentation over Moses' death (comp. Epstein, "Mi-Ḳadmoniyyot ha-Yehudim," pp. 128 and xlv. ).